From couch potato to river rat. Yesterday we turned vegetative emerging only long enough to bake a few cookies then head back to a horizontal position. So as soon as we became conscious today we were itching to get some fresh air and some exercise. 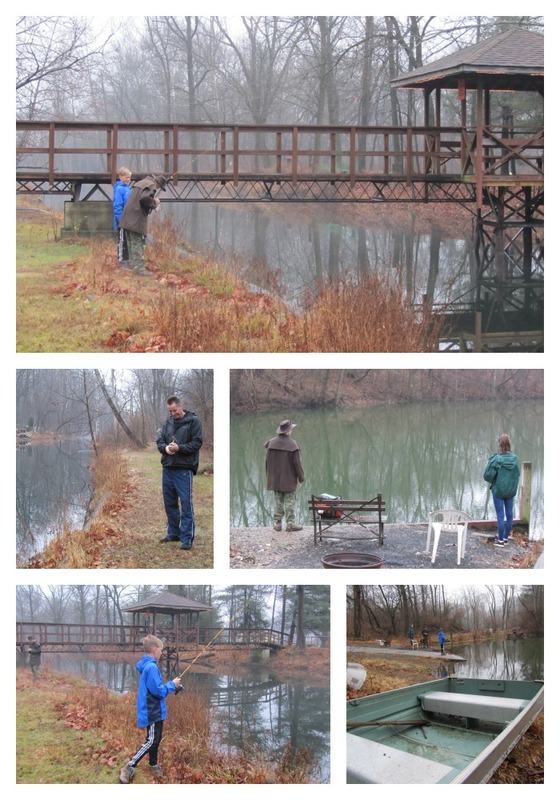 Despite the drizzling rain and the fog the river was calling our names so with our trusty tour guides and a few fishing poles we went to investigate the Lehigh River. We've done this river on past trips from tubing, to BBQ'ing, to drinking, to using it as a photographic backdrop. This is the first time we've done the river in winter. It's possibly the first time we've fished*. It's definitely the first time we've hung out by one of its side canals. The Lehigh River is a tributary of the Delaware River and located in Eastern Pennsylvania. It's sourced from the Pocono Peak Lake and flows near Allentown, Bethlehem, Northampton, Easton, Lehighton and Scranton. It also just happens to be the river where my bestie has her caravan and spends much of her time in the summer! Oh and it is the spot which houses their fave club which has a bar and serves awesome hot wings. Guess where we'll be eating dinner? *I am using the "royal 'we'" of course. The family fished, I watched. Wouldn't want to break a nail.